A few of the industry's most successful digital pioneers wax nostalgic about "killer apps" and missed opportunities. The rise of digital media over the last half century has resulted in an explosion of choices for consumers: apps, websites, digital video, streaming services, live television and scripted television. But the democratization of entertainment has also split audiences across that ever-expanding array of outlets, and advertisers are still learning how to deal with that segmentation to reach the right audiences. 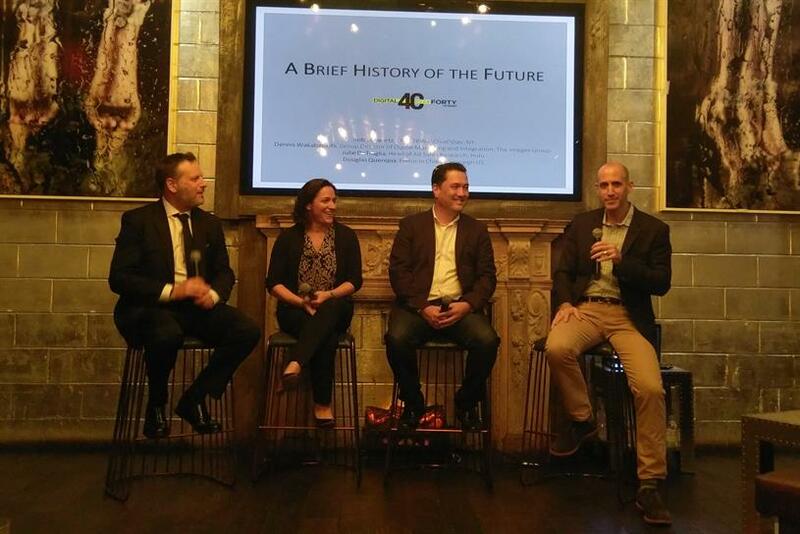 A panel of digital pioneers, gathered to honor Campaign US' first-ever Digital 40 Over 40 list Tuesday night, reminisced about the most important innovations they’ve seen over their careers in a wide-ranging discussion about the evolution of marketing in the digital age. "When ‘Cheers’ aired its final show, everybody watched it. Now, it’s very hard to get ahead, because there are so many different tribes in so many different silos," said Rob Schwartz, CEO of TBWA\Chiat\Day New York. Schwartz was joined by two of the honorees—Julie DeTraglia, head of ad sales research at Hulu, and Dennis Wakabayashi, group director of digital marketing and integration at The Integer Group—on a panel moderated by Campaign US Editor-in-Chief Douglas Quenqua, at the Dream Hotel in downtown Manhattan. Wakabayashi called Wordpress "a seminal app for the web," praising it for its groundbreaking advancement of open-source content. "The idea of a self-propagating piece of code that transfers rights management to all of the users is a killer app," he said. "Now that engine powers a lot of how we think about modularity and how it drives search." As for the future, Wakabayashi is keeping an eye on augmented reality and artificial intelligence. "AI is getting a lot smarter," he said. "The chatbots are here to stay." But even the most prescient marketers can’t always tell where audiences are headed. After YouTube burst onto the scene in 2005, the major TV networks struggled to figure out how to respond, DeTraglia said. "For a while, NBC was taking down content," like popular clips from "Saturday Night Live," she said, before they realized it was driving viewership. Eventually, the networks came together to form their own streaming service, which evolved into Hulu. "It’s a really exciting time, but we’re also trying to move the needle in the way people experience television," DeTraglia said. "But you are also stuck in the model that has worked for everybody for 75 years and made a whole bunch of money." Schwartz recalled that agencies were slow to adopt mobile as a primary platform for advertising, at least until after the debut of the iPhone in 2007. "The attention was so on the desktop that maybe we weren’t paying attention to the phone," he said, "because we were so obsessed with getting banner clickthrough rates to stay strong." The next challenge is to figure out how to monetize successful products that aren’t making any money, said DeTraglia. That requires educating consumers about "how this whole ecosystem works together. There’s a trade-off, and you get something because you’re willing to hear from advertisers," she said. "Non ad-supported models aren’t necessarily sustainable forever." Whatever happens, the most successful digital marketers will maintain "a continuous sense of discovery," Wakabayashi said. "It’s always about understanding what’s happening next and trying to make that relevant to yourself or others."